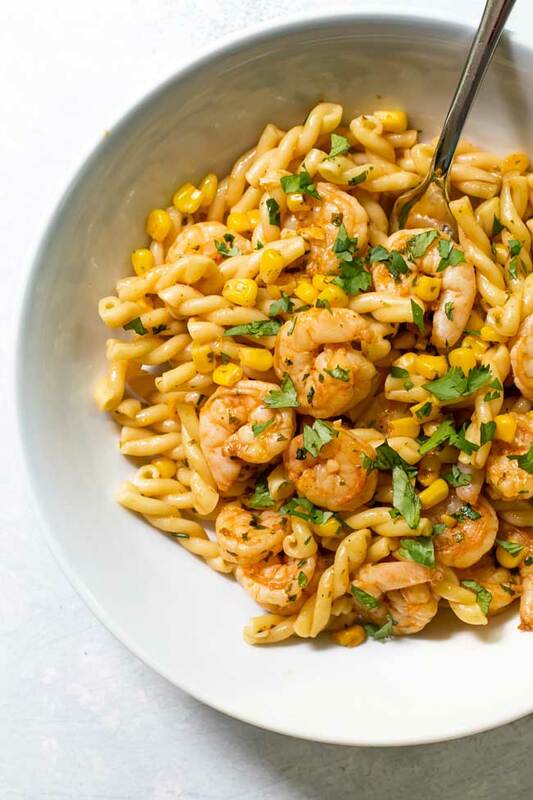 Pasta tossed with chili-spiced shrimp and corn in a cilantro-butter sauce flavored with garlic. 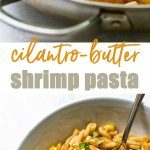 This cilantro-butter shrimp pasta is a southwest-twist on a shrimp scampi and goes from pan to table in about ten minutes. 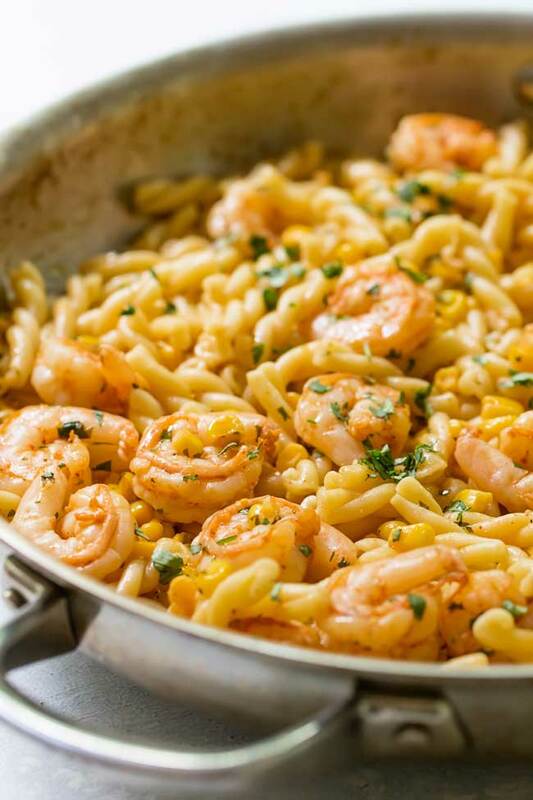 Garlic, butter, and shrimp are a classic combo and there really isn’t anything easier because shrimp take all of a few minutes to cook through which means shrimp scampi – a perennial seafood restaurant favorite – is totally doable on a weeknight without having to leave the house (hello stretchy pants and Netflix!). 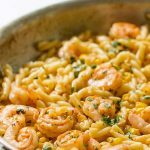 But, I already have a couple shrimp scampi-like dishes (see garlic butter shrimp pasta and lemon butter shrimp with parmesan toast) that don’t veer too far off the road as far as the classic goes and so I wanted to develop something new that strikes a familiar chord but with slightly different flavors. That something new is cilantro-butter shrimp pasta. It has lots of lemon juice plus a generous helping of zest and, of course, butter, but the addition of fresh cilantro, chili seasoning, and corn makes it more southwestern-y and decidedly more summery in both its flavor and appearance. Plus, it’s fairly quick to prep and cook – two qualities summer dishes must have in my book. More often than not I turn to frozen shrimp instead of fresh ever since I learned that most shrimp at the seafood counter are previously frozen and thawed for display. Plus, frozen ones are just so convenient – you can buy a bag and keep them on hand for whenever you need them. Plus, there’s no peeling or deveining involved – all the work is done for you. I used 51-60 count shrimp for this recipe. You need to thaw the frozen shrimp before cooking them, which is pretty easy. Place them in a large bowl, cover them with cold water and 15-20 minutes later they are ready to use. I drain them and pat them dry with paper towels before cooking them. The southwest flair starts with some chili powder – it adds a lot of flavor to the shrimp and gives them a nice color, too. While it’s wonderful to use fresh corn when it’s available during the summer I always seem to have frozen corn kernels stashed in my freezer. No need to thaw them – you can toss them right in the pan with the melted butter and garlic. Fresh lemon juice and lemon zest add a lot of zing and brightness and some chopped fresh cilantro adds its distinctive flavor and a pop of color. I used gemelli pasta but any short pasta like ziti, penne, or rotini will work well, too. 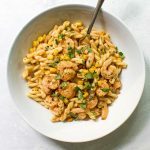 Pasta tossed with chili-spiced shrimp and corn in a cilantro-butter sauce – it’s fresh, summery, and a twist on traditional shrimp scampi. In a medium-sized bowl, toss the shrimp with the chili powder, 1/2 teaspoon of salt, and the black pepper. Boil the pasta according to package directions. While the pasta boils, melt 1 tablespoon of butter in a large skillet over medium heat. Add the garlic, corn and 1/2 teaspoon of salt. Cook the corn and garlic in the butter until the corn is warmed through, about two minutes. Add the rest of the butter and the lemon zest and juice and stir until the butter is melted and combined with the lemon juice. Add the shrimp and stir to coat it in the butter. Cook it for four to five minutes, stirring frequently. Add the cilantro and pasta and stir to coat the pasta in the butter. Cook for another one to two minutes, or until the shrimp are opaque. I happily use frozen shrimp most of the time because it’s convenient – no need to peel and devein them. To thaw them, I place them in a large bowl and cover them with cold water. They usually thaw within 15 to 20 minutes. Once thawed I drain them and blot them dry with paper towels. OMG… dying. This looks incredible!!! I may make (or request) this for the weekend. This looks fantastic! I am literally obsessed with cilantro these days. Yum!